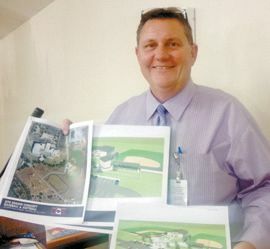 By Pat VerSteeg — This past Tuesday, CHS Superintendent Robert Trammell spoke to Kiwanis/Senior Citizens about the new Sports Complex being built just west of the Cheyenne Public School. Trammell began by saying, “I want everyone to know that I attended 3 public meetings about the possibility of the school buying the city ball fields. As a result, the city and school board could not come to an agreement regarding the transition of that property.